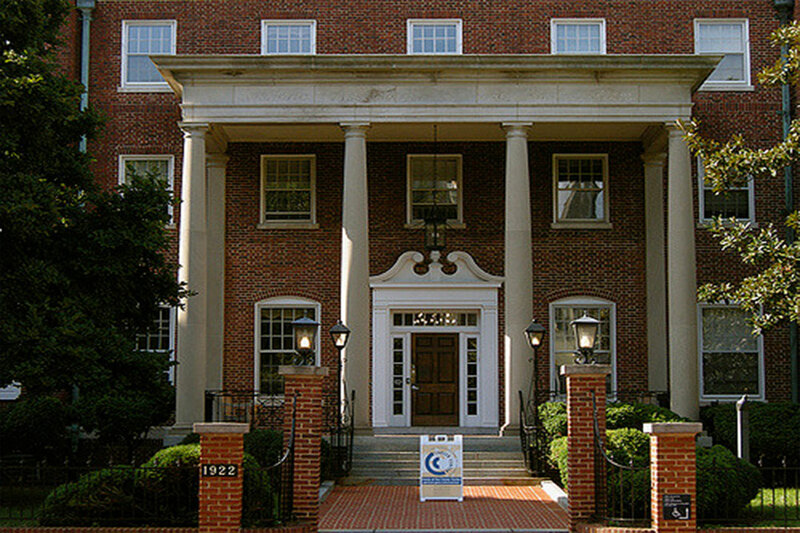 GW is committed to adopting practices and nurturing ecosystems services that strengthen habitat and optimize natural space on its campuses, in the Chesapeake region and across its global footprint. GW thinks about both aesthetic beauty and biodiversity as it plans its landscaping, using its Sustainable Landscape Guidelines to reverse ecosystem degradation and ultimately create environments that generate greater health and resilience for the natural world and for the campus community. Published in 2017, GW’s Sustainable Landscape Guidelines help the university manage its green space as a regenerative landscape that draws from the self-healing and self-organizing capacity of natural plant communities. The guidelines provide guidance for each city square or block the campus occupies — including recommendations for the tree canopy, diverse plantings, turf, soil, urban agriculture and edible landscaping, aesthetics and low-impact development options such as rain gardens and pervious paving. 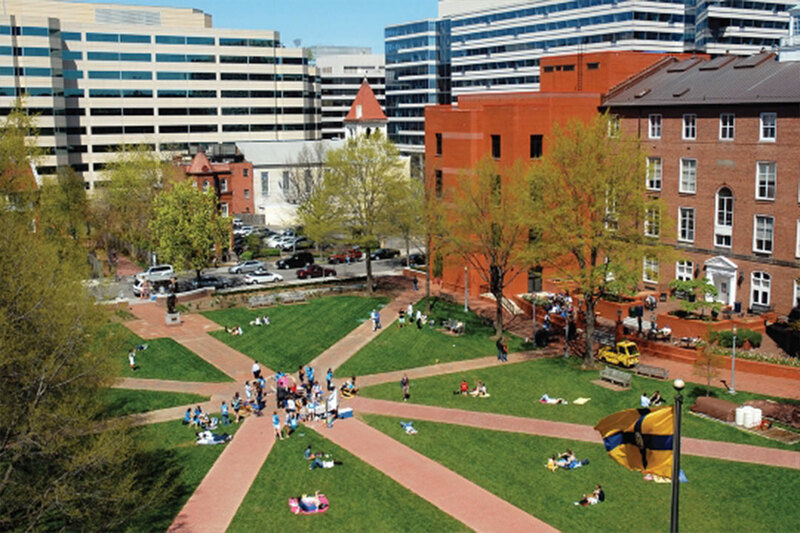 Developing these guidelines was a positive step toward meeting GW’s targets to increase green space and enhance the biological richness and diversity on its campuses. 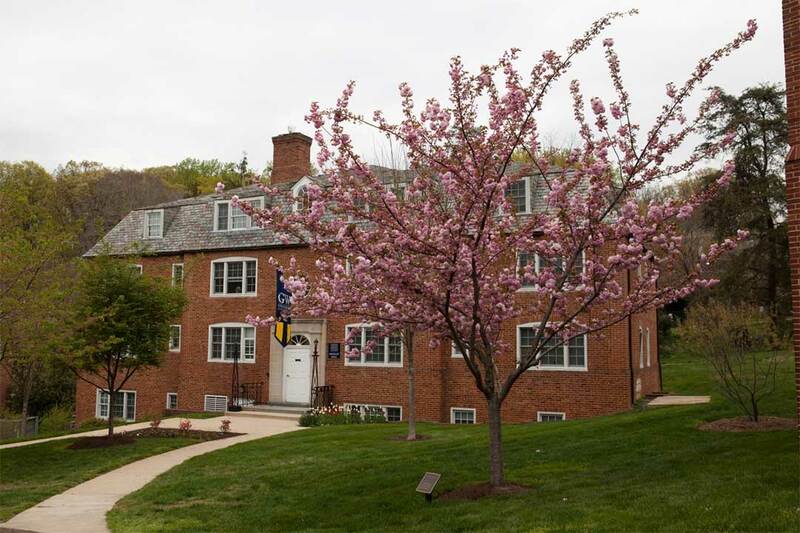 The report is the result of a partnership between the university, faculty and students in the College of Professional Studies’ Sustainable Landscapes Program, with significant contributions from the local D.C. organization Casey Trees. Excessive nighttime light (light pollution) can disrupt the natural rhythms of plants and animals and have negative impacts on the psychological well-being and sleep cycles of people. 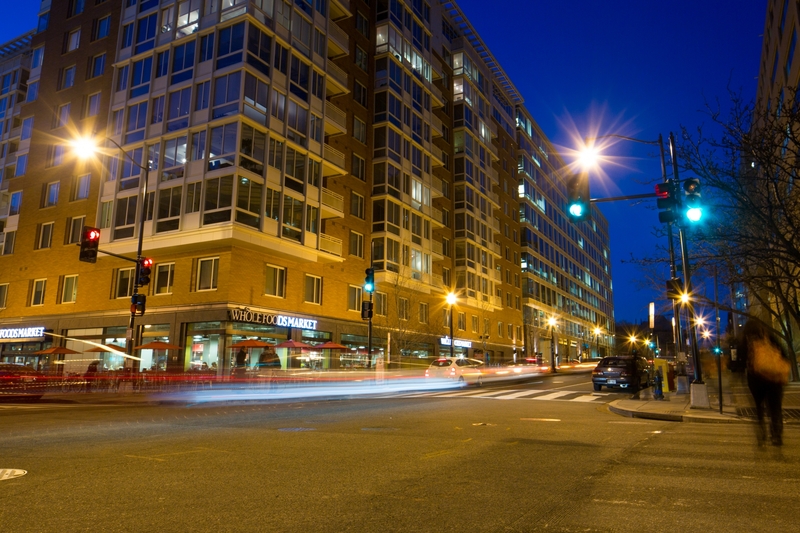 By minimizing unnecessary exterior lighting, using motion and occupancy sensors and installing fixtures that direct exterior light downward, GW reduces energy use and light pollution while maintaining campus safety. 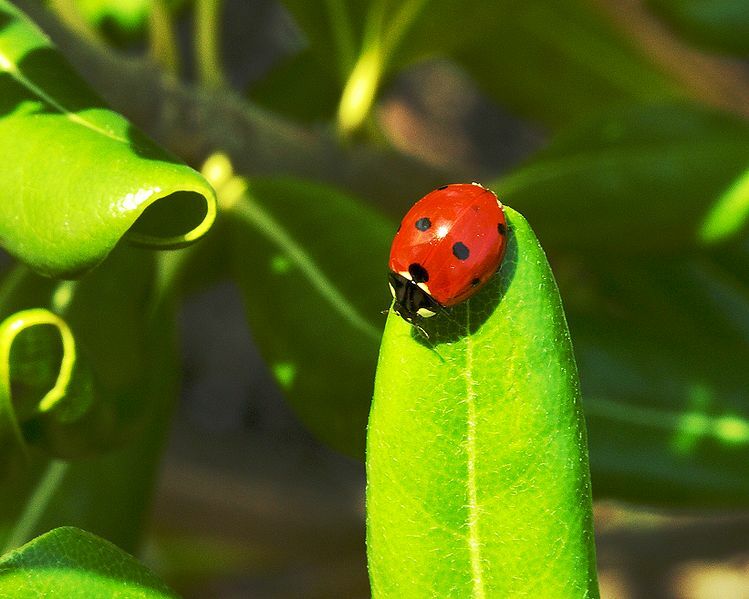 GW has been insecticide-free since 2014, using beneficial insects — instead of harsh chemicals — to manage pests and keep plants on its campuses healthy and vibrant. Choosing plants that are insect- and disease-resistant also helps to limit the need for pesticides and fungicides. 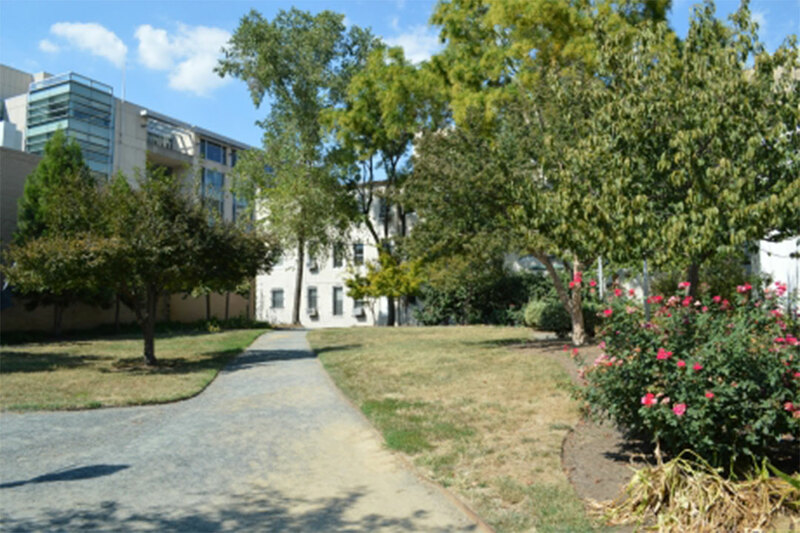 GW adds to the beautification and the biodiversity of its campuses by planting native plants, which attract birds and butterflies. These tend to require less long term maintenance and use less water, creating a more sustainable landscape. With only one percent of their original population remaining, the Chesapeake Bay’s oysters need all the help they can get. 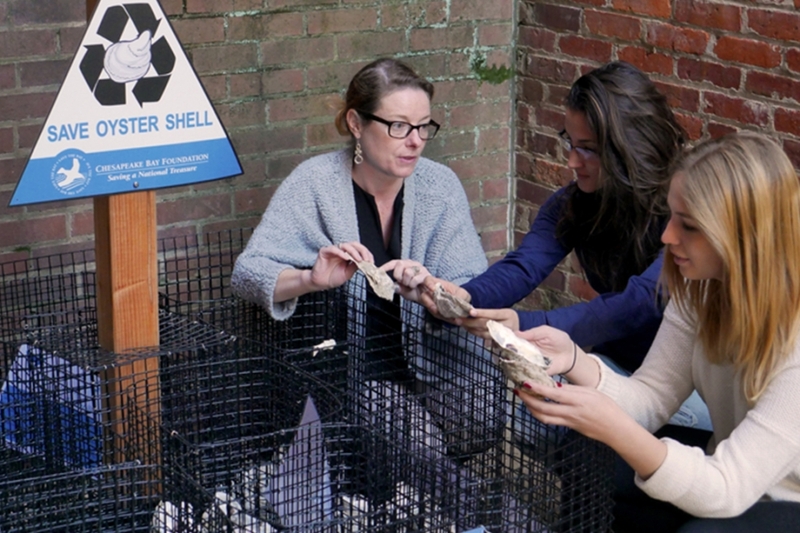 A student-initiated project to collect oyster shells is one of several led by biology professor Tara Scully that focuses on restoring biodiversity in the Bay. Through the oyster shell recovery program, student volunteers collect oyster shells from area restaurants and community members. After the shells are cleaned and dried, they are returned to the Bay to help rebuild the population by providing homes for baby oysters. Students are also raising oysters and measuring the effects of herbicides and pesticides on the Bay’s marine life – all aimed at improving the health of the Bay. We offer volunteer opportunities on projects ranging from planting new beds, to pruning and weeding existing greenery, to watering newly planted trees. This unique water reclamation park captures and retains all water that falls on the site. Through a network of cisterns, tunnels, permeable surface and rain barrels, this 3/4 acre site highlights the technological possibilities for managing stormwater. Nestled in the heart of an urban campus, University Yard is a favorite outdoor spot for students to study, relax, and meet up with friends. 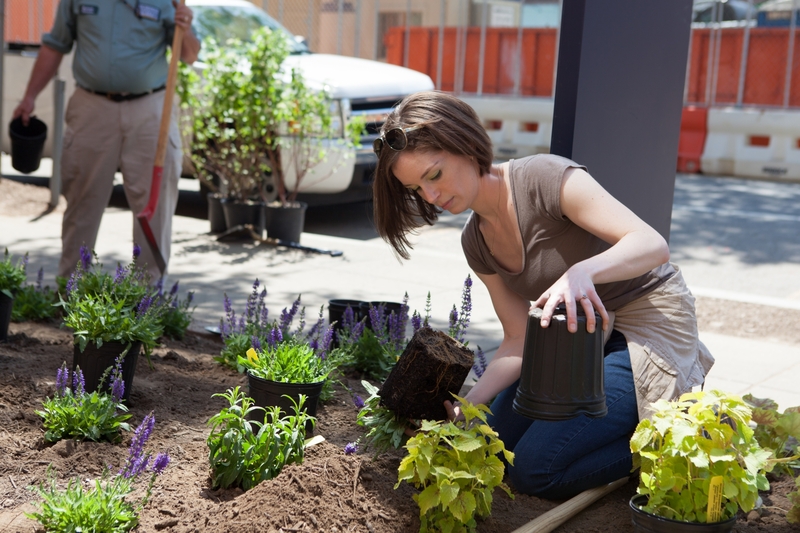 Next to GW Deli, G Street Park is undergoing a project to transform an underutilized lawn into a vibrant native planting. As cities cope with the increasing stresses of climate change, pockets of green space hold vast potential to perform critical ecological services while providing a space for relaxation. 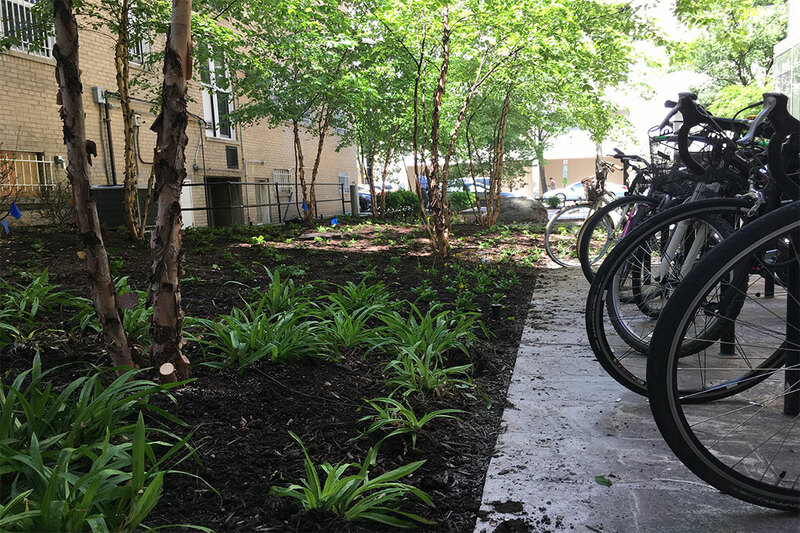 The pedestrian breezeway between Fulbright Hall and Science and Engineering Hall has recently undergone a landscape renovation that included over 10,000 native plants. 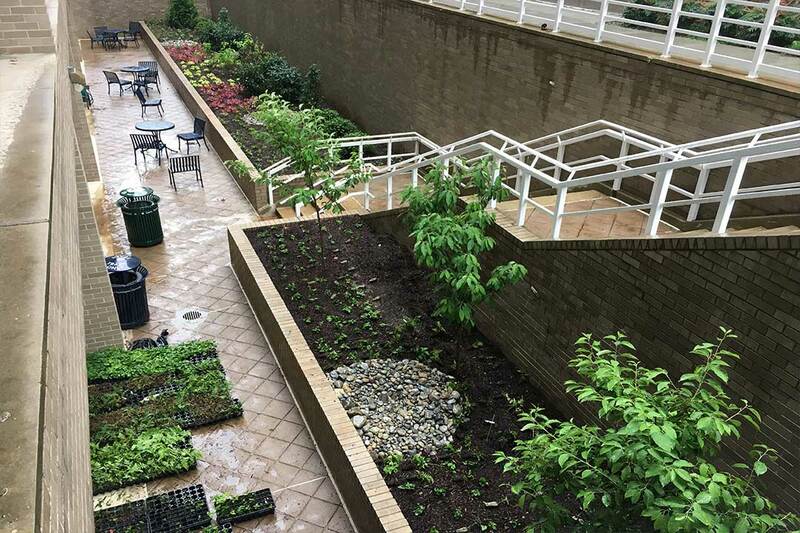 This site serves as an example of how to use the Sustainable Landscape Guidelines to transform an ecologically sterile site on campus into a garden. 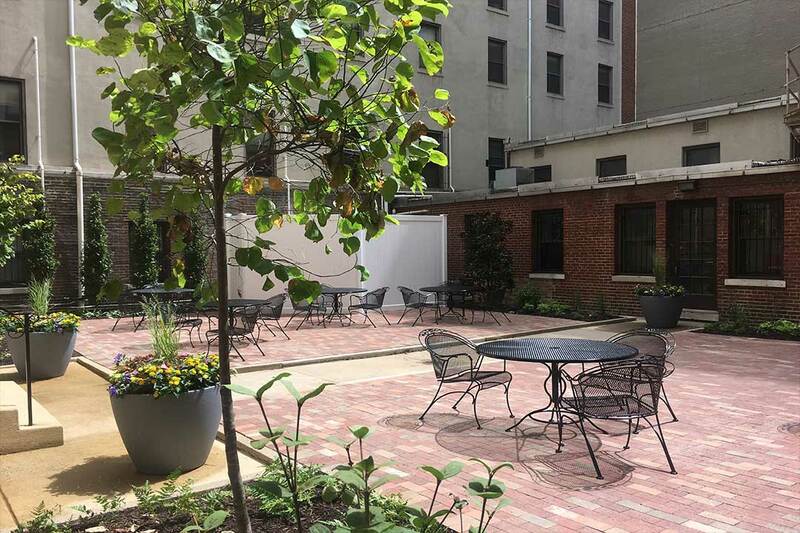 Hidden below street level between Phillips Hall and District House, this newly refurbished seating area features beautiful greenery and a quiet respite from the noise of the city. The front yard of Old Main has gotten a makeover with an array of allium 'summer beauty' and rudbeckia 'goldstrum' which become pollinator magnets when they leaf out in the summer months. 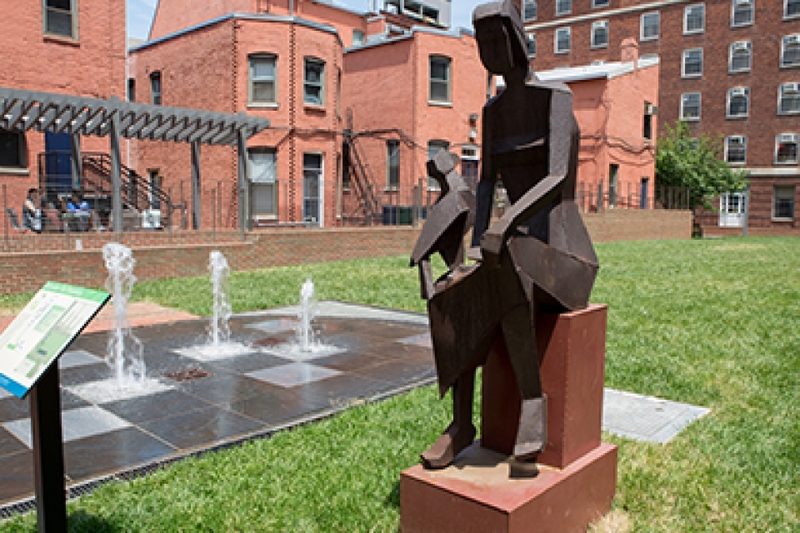 A prefect example of an urban escape, this courtyard features sixteen trees and ample seating. Because of the trees' columnar growing habit, the canopy provides a green cathedral-like experience. This space was unusable by students for many years but is restored to provide more outdoor community space for students. In partnership with Adele Ashkar, Associate Professor of Landscape Design, and her students, a new landscape project will be launched to mitigate stormwater runoff challenges around Clark and Hensley Halls.